Another name change and the main City street leads into the area of town flattened in the war. Well, actually M&S was one of the few frontages left intact. 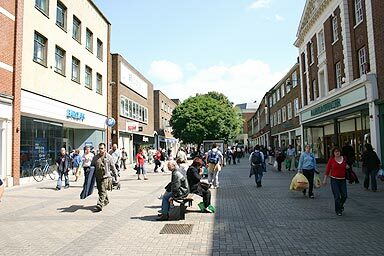 This was the earliest piece of the town to be pedestrianised. The trees were planted when mature, they have not grown here. The trees hide the utilitarian architecture that was built here. It's a place where people sit and buskers play except on Market days when the space is jammed with people trying to get past the stalls. On your right is Rose Lane, leading to more postwar development, some in concrete, some not.